Aminoglycosides Pharmacology | All the Facts in One Place! Aminoglycosides are among the most widely used antibacterial drugs. They have, through the introduction of Streptomycin, been around since the 1940s. Though bacterial resistance continues to increase, they remain an important antibacterial class. Aminoglycosides are used to treat a wide variety of bacterial infections – most effective against aerobic, Gram-negative infections (including Pseudomonas aeruginosa). They are generally ineffective against Streptococci and anaerobic bacteria. Let’s take a few minutes to learn more about aminoglycosides pharmacology; how they work to exert their therapeutic effect. Aminoglycosides are protein synthesis inhibitors. Aminoglycosides enter bacterial cells through oxygen-dependent transport system. This transport system is not present in anaerobic or Streptococci bacteria – meaning they have intrinsic resistance to these medicines. However, aerobic Gram-negative bacteria do have this transport system. When aminoglycosides enter vulnerable bacterial cells, they irreversibly bind to the bacterial ribosome – inhibiting protein synthesis. More specifically, aminoglycosides bind to the 30S ribosomal subunit, a binding that has a bactericidal effect. At the 30S unit, aminoglycosides disrupt mRNA translation. Aminoglycosides are associated with their own range of potential side effects. Nephrotoxicity and ototoxicity are often reversible, though not always. Nephrotoxicity has led to death and, in other cases, hearing loss is permanent. That’s because aminoglycosides trigger apoptosis in renal tubular epithelial cells and in cochlear cells. Patients often experience ototoxicity only in the post-infection period. Approximately 1 in 10 patients receiving aminoglycoside therapy will experience ototoxicity in some form. Similar factors – such as age, hepatic and renal impairment, high doses for prolonged periods, and in patients taking diuretics (for example – furosemide) – increase this risk. Nephrotoxicity is accompanied by reduced urine production, elevated serum creatinine levels and rising urea levels. Nephrotoxicity risk increases if the patient is also taking cephalosporins, ciclosporin or platinum chemotherapy. Ototoxicity often presents in the post-infection phase. Affected persons may experience tinnitus, hearing loss and vertigo. In some cases, ototoxicity is irreversible. As aminoglycosides are eliminated via the renal route, certain populations – such as neonates, the elderly and patients with existing renal damage – are at an increased risk of nephrotoxicity and ototoxicity. Aminoglycosides should be avoided in patients with myasthenia gravis – they exacerbate muscle weakness by interfering with neuromuscular transmission. The risk of ototoxicity is elevated if aminoglycosides are administered alongside loop diuretics (such as furosemide). The risk of both ototoxicity and nephrotoxicity increases when aminoglycosides are administered alongside vancomycin, another antibacterial drug. Some drugs, such as penicillins, work by disrupting the cell wall – meaning that penicillins may encourage aminoglycoside uptake by vulnerable bacterial cells. Aminoglycosides are not absorbed from the gut. They are, then, administered via the intravenous or intramuscular route. Many, such as gentamicin, are administered via IV infusion in severe infection. Dose is dependent upon weight and the patient’s renal function. Therapeutic drug monitoring (TDM) is essential. Tobramycin can be administered via the nebulized route, too. Aminoglycosides have been around since the 1940s, with the introduction of streptomycin – a drug effective in the treatment of tuberculosis. Though resistance is on the increase, these drugs remain an important drug class in the treatment of serious bacterial infections. 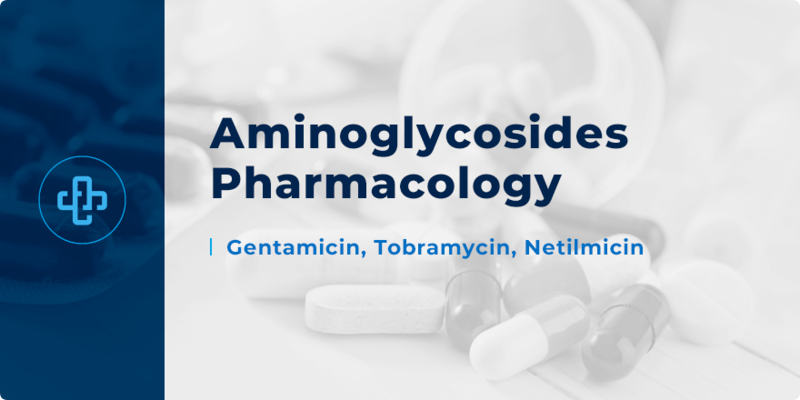 Want to learn more about aminoglycosides pharmacology? Join our member’s area today. With infographics, tutorials, quizzes and mnemonics, we help you learn the essential facts about aminoglycosides as well as every other major drug class. In the meantime, take a few moments to join our pharmacy blog newsletter (above) to receive all the latest facts direct to your email!